1. Check Paytm Postpaid: Go to Profile, Click onPaytm Postpaid. 3. Get your Spends Limit: Based on your Paytm Purchases. 4. Shop Anytime Anywhere: Choose Paytm Postpaid as Payment Mode. 5. View Purchases in Passbook: All your Paytm Postpaid orders will be visible in Passbook. 6. Pay by 15th Next Month: Repay using Wallet, Debit Cards & Netbanking. Generally, a gateway can be used for many types of payment methods but for the purpose of this guide on msnTarGet.com media, we will solely focus on online credit card payment. Tokenisation has become one of the preferred methods of card payments in Western countries. Now, it comes to India. As per D.K. 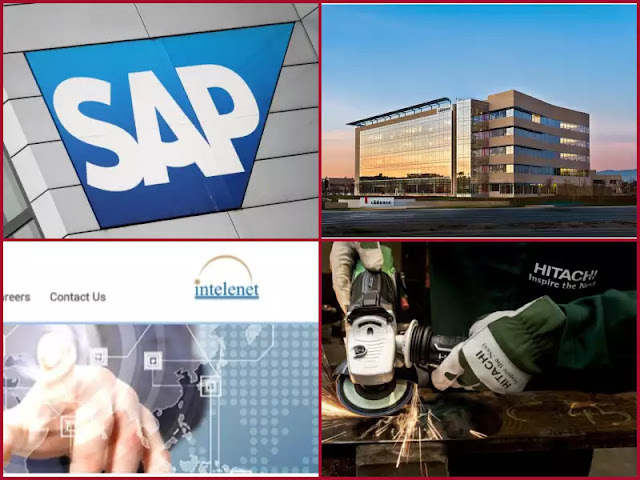 Joshi, the service sectors, which contributed to a large part of India’s growth, have been giving poorer results since several quarters in the past, which is a cause of worry. How will it stop frauds? And how does this work? However, in case any such service provider/website/app gets hacked, then users’ card details can be compromised, and data stolen. To avoid this scenario, RBI has now allowed ‘Tokenisation’ of card payments, which will avoid such frauds/data theft. ‘Tokenisation’ Of Card Payments: How Does This Work? In this system, instead of saving the actual card details: name, card numbers, expiry date etc, the user will be able to generate a unique ‘token’ or a virtual card for a specific service. Each such tokens would be unique for a service, and the same token cannot be used elsewhere, which provides better security. QR code-based payments and more. 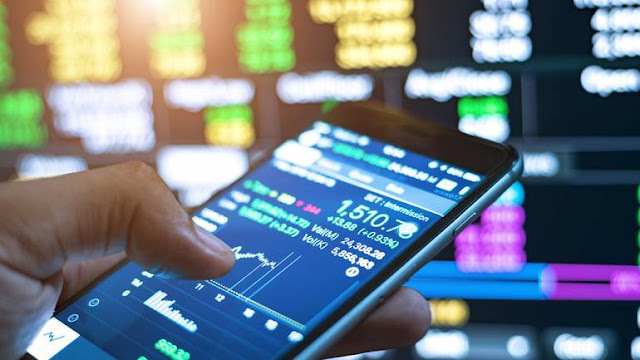 RBI is expected to issue more guidelines and regulations for this new concept of card payments, which has become quite popular in Western countries. The battle of ecommerce in India has taken a new turn, as World’s largest Internet company: Google has officially launched their shopping website in India. Powered with Artificial Intelligence, and Machine Learning, this new Shopping Website promises stunning deals and customized offer. And, the best part? Hindi language is supported. Will this new initiative by Google challenge Amazon? Let’s see! Google Shopping Website Launched In India With AI-Powered Suggestions, Hindi Support - Can Google's shopping website disrupt ecommerce in India? Google App on mobile: A new tab of Shopping will be visible when you search for any product, say Nike shoes. Google Shopping website is basically a platform to showcase one particular product’s reviews, price, offers across various online retailers. 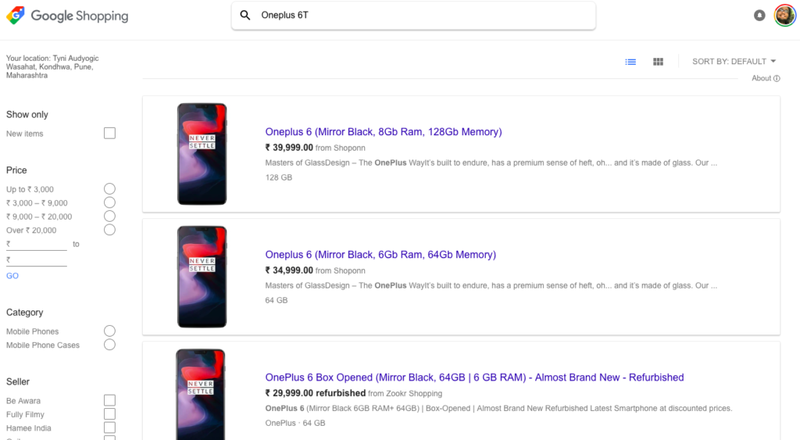 Hence, say we search for OnePlus 6T on Google Shopping. The products listed can be sorted via price, sellers, ratings and more. 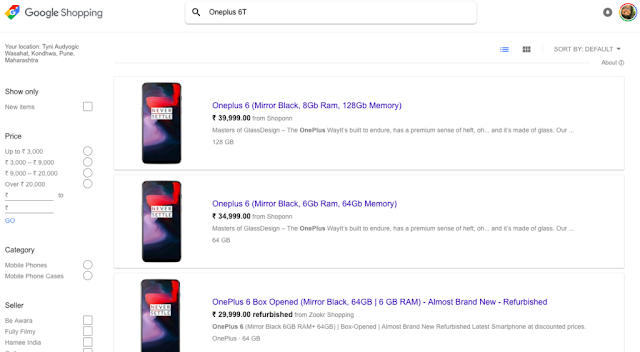 When we searched OnePlus 6T, then the first 10 listings were from a site called ShopOnn, whose link failed to open in 5 minutes. While searching Nike Shows, Amazon India listings opened up. Style Search via Google Lens has been linked with Google Shopping, and this means that whenever you see an interesting product, all you need to do is point the Google Lens and complete your shopping. Based on the Google searches done, Google Shopping website will point out products to the users, and recommend them. In the month of October, Google has launched this new Shopping Tab, in collaboration with Flipkart, Snapdeal and Paytm, which allowed users to directly pay via Google itself. But now, a dedicated website has been launched, which makes their intentions more serious and focussed. Will Google Shopping be able to lure online shoppers in India? Do let us know, by commenting right here! Buying New House? Your Wife Can No Longer Help You To Save Tax – This Is What Changed, Tax benefits waived off only if new property is in taxpayer's name. Online Sale Of Medicines Banned Across India – A Big Blow To Ecommerce In India? As per Delhi HC, sale of online medicines is harmful for all Indians. Buying a flat in the name of the woman in the house is a great idea, but only for a long-term investment. If the property is being bought with the purpose of trading, tax benefits will not be applicable: only because the flat is in the woman’s name. A recent case in Mumbai was where this news was brought into the limelight. The Income Tax Appellate Tribune (ITAT)’s Mumbai bench denied a taxpayer income tax benefits available on a long-term capital gain (LTGC). The concerned person was looking to buy a new flat by selling the old one. But as the new flat was in the name of his wife, he was denied tax benefits. Buying New House? Your Wife Can No Longer Help You To Save Tax – This Is What Changed, Tax benefits waived off only if new property is in taxpayer's name. Online Sale Of Medicines Banned Across India – A Big Blow To Ecommerce In India? As per Delhi HC, sale of online medicines is harmful for all Indians. R Gavankar had purchased a new, second flat jointly with his wife. He did not pay the tax applicable on the LTCG of the old house, on which Income Tax officials demanded 50% of the LTGC of Rs 17.5 lakh. Gavankar’s claim of deduction under Section 54 was denied. He was informed that to avail benefits of tax waive on LTCG under section 54 only if the owner of the second house was the taxpayer, i.e. Gavankar himself. What does the Income Tax Act say? According to section 54 of Income Tax Act, if you buy a new property within 2 years of selling an old property, the long-term capital gains tax is waived off the income you earn from selling the old property. As per the Income Tax Act, if you buy and hold a residential property for a minimum of two years before selling it, the profit earned on that property is called long-term capital gain. After the adjustment for inflation (indexation Benefit), this gain is taxable at 20%. But, if this profit is used in a transaction to buy a new property, the tax is waived off. Clearly, the amount not used in buying the new property is taxable. Puneet Gupta, Director at People Advisory Services said that the taxpayers who fall under the jurisdiction of Bombay High Court must be careful to avoid tax litigation. If a taxpayer is looking to buy a house in the name of their children or spouse, it would be good sense to include their own name in the registration as well. In simple words, if a property is bought under the joint names of the taxpayer and his spouse and/or children, then the tax will be waived off of one third the cost of the new property bought. A social initiative to empower women enables them to buy a property under their own name at a 2 % lower transaction cost. If the property is in the name of a close relative (son/daughter/wife) who is not earning, and if the property is let out or on rent, the rental income from this property will be treated as the husband’s income and will be applicable to tax at a normal rate. If you purchase a house in the name of the wife but use your own funds, this means you are using her name as name lender and is considered illegal. You can make this legal by gifting the money to your wife for her to be able to buy said property. But, this requires the property income to be added to your income and will be taxable. A loophole in this is to loan your wife the money in exchange for her jewelry of the same amount. In such cases, the rent from the property will not be applicable to you. The wife may not be given loan by housing finance companies if she is unemployed. Loans are granted to the owner of the house and a co-applicant is not entitled to concessions of any sort. If you are looking to invest in a property, make sure you take all these conditions into consideration. In a big blow to e-commerce in India, Delhi High Court has banned the sale of online medicines across India. Why this extreme decision was taken? What will happen now to the sale of online medicines? A bench of Chief Justice Rajendra Menon and Justice V K Rao gave their order on the ban of selling any type of medicines online. The Bench has directed Centre and AAP Govt in Delhi to immediately implement the order, and stop ecommerce portals from selling online medicines. This order will directly impact leading online portals for selling medicines such as Practo, 1MG, Netmeds, WeChemist and others. The bench of Delhi High Court announced this verdict after a PIL was filed by Delhi-based dermatologist Zaheer Ahmed, which was represented by advocate Nakul Mohta. Drug Controller General of India in 2015 had ordered all State Drug Controllers to regulate online sales. But Govt. was not able to control it, and this can cause widespread harm to society. Uneducated users of the Internet from rural areas are ordering harmful medicines, which can be abused by addicts. The issue of online sales of medicines had been controversial since some time, but no one expected this extreme order by Delhi HC. Entire pharma industry of India had declared an all-out war against e-commerce in 2015, as the protests picked up steam after that. In 2016, Drug Controller General of India had stopped all e-commerce portals from selling medicines online, but this didn’t make any change in the online business. In 2015, Snapdeal’s warehouses were raided by Food & Drug Administration (FDA) for selling drugs/medicines without a prescription. Govt. had attempted to regulate the sale of online medicines by ordering that online portal will be allowed to sell online registered drugs, that too with a prescription. In September, offline medicine sellers and chemists had announced a nation-wide strike wherein more than 8.5 lakh shop owners had shut down their business to protest against online sales. Now, all eyes set on IAMAI, and online medicine portals, to take the next step. We will keep you updated.